We are pleased to announce the arrival of our first Palomino part bred Arabian at Chapel Lane Arabians. 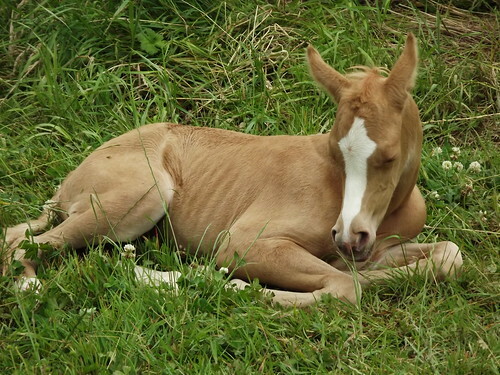 No name yet but this filly is adorable. Heather I would recommend Mahalias Marcus for definite. I bought my mare from Jason Nunn at Pinewood Palominos. I wanted to buy a mare and use his cremello stallion Billy, as he'd been highly recommended to me. When I visited the Stud Marcus just 'blew me away'. Super horse with a super gentle nature. You will not be disappointed. Speak to Jason, let him know I've recommended you & he'll look after you for sure. Jason is quite new to horses, despite the amount of horses they keep but he cares allot for them. If you want to use one of his stallions, tell him your requirements and I'm sure he'll deliver. I am thinking of using the same stud, either for pewitts dancing billy or Mahalias Marcus, were they nice there ? was your mare looked after nicely ? please pm me for reply ... lucky you... lovely filly ! She is gorgeous and now also has a lovely name. Beautiful name for a beautiful filly! Glo pally foals come in all sorts of shades at birth, my little girl was an apricot colour when born and is just now starting to get a white mane. Happy new foalie :-) She's gorgeous!!! She is lovely, just noticed looks like she has some white on her legs! I've got 2 dew next year, can't wait.